Jesus never gave up on Peter, even with His foreknowledge of the denial. For Jesus both knew where Peter’s heart was, and also the potential of the man once the Holy Spirit was in his life. Unlike so many humans who judge Jesus did not base His opinion on one moment in time. He took a far longer and deeper view, influenced also by His insights into the heart of the person concerned. Like the potter Jesus understood and accepted that true craftsmanship took time and the preparedness to deal with any faults that might appear in the process. Jesus remained committed to Peter. With incredible grace and love Jesus is described as raising Peter from the depths of sin and despair and entrusting him with a new life and purpose within His kingdom ministry. Where Peter might not have been surprised to have found himself discarded he instead found himself forgiven, accepted and included. 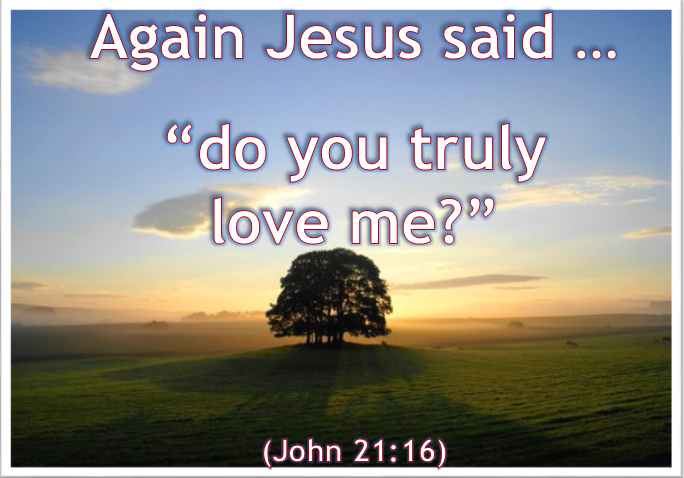 He was not asked to promise any great commitment or results – there was only one question that Jesus wanted him to answer for both of them – “Do you love Me. ?” Of all the questions that He might have asked this was the one that Peter could answer honestly and completely – for He knew that Jesus already knew the truth – “Yes Lord, You know that I love You.” It was all that Jesus wanted and needed. And the thrice repeated question and answer dealt with the three earlier denials. All of us will, to a greater or lesser extent, experience failure and unfaithfulness in our lives – to ourselves, to others and especially to the Lord. The wonder of our relationship with our Lord Jesus is that He is always there with us, urging us to get up again, leading and empowering us through the Holy Spirit, and encouraging us to have another go at life. This is the life He has for us, in His way and with the revelation of His truth. He is the God of life, the resurrected life, and it all starts and continues with love – His love for us and ours for Him. Today He holds His hand out to each one of us, inviting us to leave the past behind and to enter into a deeper life with Him – the God of the resurrected life. Thank You Lord Jesus for Your death and resurrection for me. Please help me to love You more and more and in that love to walk with You into the life that You have prepared for me – both here and in eternity – trusting You for all that I need. Amen.